With its International Code Council evaluation report of TERM, Report Number ESR 3632 represents a significant expansion of available physical termite barriers which can be considered to meet the “approved by code” requirement. By designing non-chemical barriers into structures, architects are using a systems approach. 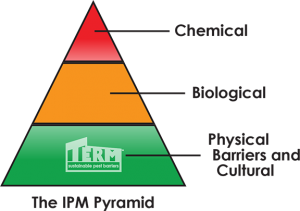 IPM, used for decades in both the agricultural and structural pest control worlds, uses a systems approach to reduce the number of pests, and the amount of pesticides applied to crops and structures. That is what this website, and Polyguard’s efforts since 1999, is about. Designing and building effective non-chemical pest preventive measures into the structure can be done today; with most of it incorporated into the building waterproofing. We believe that non-chemical pest barriers are the next level for the building envelope’s contribution to sustainable construction.